Last night I paid a visit to my tree, Hope. Hope is planted in Hopewell, NJ at the home of my friends, Pete and Mara. On my drive to the country I wondered how I would find her. Could she have grown? Would there be fruit? Nope, no fruit. And she looked pretty much the same to me, but maybe a bit more worn; and shorter. “She’s aging nicely..” Mara said. I agreed. 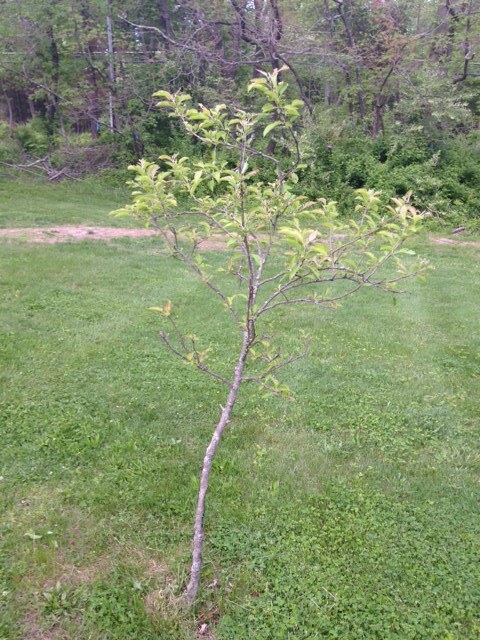 My tree is four now, she’s a bit shorter because her roots are settling into the ground; she’s a bit worn because the deer nibble at her bark. But she is growing strong from the inside out, she no longer needs the protective net that used to cover her. She is subject to the elements just like the tall steady trees that surround her. What a witness they are; what inspiration they provide. I feel like this tree. The same but different. Growing stronger from the inside out. Shorter, having been humbled – continuing to be. And a bit worn from nibbling deer. But firmly rooted, steady and inspired. Ironically I’ve been emphasizing tree pose this week in my yoga teachings. Or maybe that’s not ironic. I look forward to Hope’s first fruit. For we, who have no clue what sort of apples she will bring forth, will delight in surprise and sweet satisfaction. Amen.